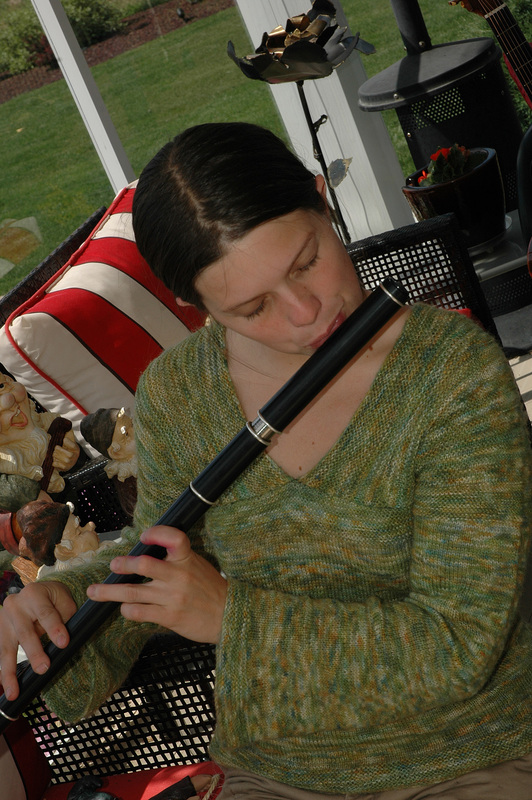 The musical idea started about 10 years ago when two neighbors discovered their mutual interest in Celtic music. At that time Wally Smith was playing Irish Whistles and Rod Wilson played various fretted instruments and because of their close geographic proximity they started practicing about once a week. To provide some sonic variety Wally acquired a button accordion and more recently a set of Scottish Small pipes. Eventually the group started to perform at local coffee houses under the name of a popular Irish Jig called ‘The Blarney Pilgrims’. Considering that they didn’t exactly know what they were doing, full of the “Blarney” so to speak, it seemed appropriate. Karly Ross, a traditional Irish Flute player from Calgary relocated to Kimberley in early 2007. Karly is also a singer / songwriter. The group managed to hookup for an impromptu performance at a local coffee house. This was the beginning of a great musical relationship. The band is always on the lookout for a fiddle player to round out the sound and from time to time is joined by guest fiddlers Barry Coulter or young Angus MacDonald. 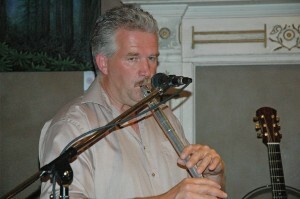 Wally Smith – Irish Whistles, Button Accordion, Mandolin, Scottish Small Pipes and hand percussion. Wally’s family is from that hot-bed of Bluegrass music, Salmon Arm. Rod Wilson – Guitars, Irish Bouzouki, Cittern, Mandolin, Irish Whistles and hand percussion. Rod is originally from Australia where he outgrew rock and roll to delve into the incredible variety of music that exists outside of the pop arena. The repertoire: Nearly all of the repertoire is music somewhat off the beaten track but within the mainstream of what has become known as Celtic Music. Because of their particular choice of instrumentation there is a tendency towards instrumental dance music such as jigs, reels and waltzes. Scattered among the tunes are traditional songs such as The Black Velvet Band, When New York was Irish, The Old Maid in the Garrett, Red River Rising, The Star of the County Down, Irene Goodnight, The Nightingale , Sweet Forget me Nots, Yarmouth Town, etc. Include the Annual Koootenay Fair at Fort Steele (the past five years);The Jaffray Fall Fair – two years running; Arts on the Edge (Kimberley, 2007);Bean Tree Café, Kimberley – regular performers over a 2-3 year period;Cranbrook City Council – Volunteers Appreciation Dinner; The Green Phoenix Restaurant (Kimberley);The Home Grown and the Locals Coffee Houses (Kimberley & Cranbrook); St. Patrick’s Night Celebrations at the Edge Pub (Kimberley); BJs Restaurant (Kimberley); United Church Coffee House; Chef Bernard’s Restaurant, and the Snow Drift Cafés in Kimberley (Rod Wilson as a solo act). 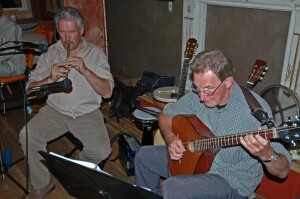 At any given time members of the group can be found in any number of musical configurations at any number of private and public music sessions that occur in the area. Please tell me these Irish Pilgrims have at least one cd available. Saw Rod at Ft Steele Kootenay Country Fair and I love the bouzouki. ….. Please look into performing at Spokanes ….Fall Folk Festival….sponsored by Folklife……I would definitely travel to hear an evening of these guys. Hi, We are a pretty informal conglomerate of musicians. The Fiddle player Angus MacDonald is originally from Nova Scotia and is heavily into Cape Breton Fiddle music. Will Nicholson is the guitar player who has only been playing a short while and is into the DADGAD tuning for Irish rhythm playing. I join them on Bouzouki to form the group LEATHER BRITCHES. 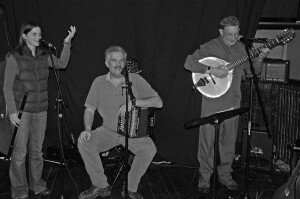 The button accordion / Whistle player is Wally Smith and along with myself on Bouzouki, Cittern, 12 string guitar and mandolin and a number of other traditional players go under the banner THE BLARNEY PILGRIMS. We don’t have a CD and have no plans at this stage to record. We are all too busy with numerous musical project. Angus plays in another band (GOOD OL’ GOATS) and I rehearse with two other groups as well. We play Fort Steele every year so you will have to revisit us next year.